Male grooming has fast become a popular market, and with the wide range of gadgets and gizmos now available, it can be difficult to choose which products are right for you. If you don’t want to go to the trouble of visiting the barber every fortnight, then investing in some of the best hair clippers and trimmers is a great way to save time and money on your grooming regime. The big difference between the two is that hair clippers are designed for trimming the hair on your head, whereas trimmers allow you to shape and define thinner hair, and therefore work best on beards and other body hair. But before picking the right trimmer for you, you'll also have to consider the type of hair you have. If you have thick hair that grows quickly, you may want to opt for clippers that come with a range of accessories such as interchangeable combs to help achieve your desired length and look. For shorter hair and beards, trimmers may come with scissors to help you tidy up your look around the edges once you’re finished styling. You can get both mains powered and cordless hair clippers and trimmers, and the one you choose depends on where and when you’ll need to use them. If you travel a lot for business then a portable trimmer will be handy for keeping yourself looking smart for those all-important meetings. Whichever kind you go for, keeping your blades clean is essential, so if you’re using it frequently, try to invest in one that comes with a cleaning brush to ensure all excess hair and any other debris is removed on a regular basis. Removable blades are also useful as in some cases these can be sharpened and then put back in, rather than you needing to completely replace your clipper or trimmer. The Philips OneBlade Hybrid Trimmer & Shaver allows you to achieve ultimate precision when trimming, styling and shaving your beard. The OneBlade aims to provide for all your shaving requirements in one tool, hence the name - it features three clip-on combs to help you achieve the length and style you want for your facial hair, which could be anything from clean shaven to short stubble to a longer, even beard. This blade shaves against the grain and is kind to sensitive skin, plus, it lasts up to 45mins once fully charged. So for its versatility and downright handiness, it takes our top spot. For those who find they're going to the barber more frequently and it’s starting to add up, then why not invest in the Wahl Lithium Power Hair Clipper for salon quality at home? These clippers are extremely easy to control through a range of hair lengths to achieve your desired hair cut quickly, easily and affordably. The self-sharpening blades are able to cut through even the thickest of hair with ease, and you can also safely clean up necklines, sideburns and around the ears. So if you want to be well-groomed and keep your hair and face looking sharp, but don't have the time nor inclination for regular barber visits, this is for you. The best vacuum beard trimmer on our list... yes, that's right, a self-cleaning clipper, hurrah! This beard trimmer is great for keeping your sink free from those blasted hair clippings, with a dedicated chamber to catch the hairs as you trim. It also has 20 settings which you can easily select to achieve the length you want. It can be connected to the mains or charged for battery use, so it's great for travel or using at home, eliminating the need to invest in two separate trimmers. You’ll get some comb accessories, adapter and cleaning brush included with this trimmer, which makes it versatile and low-maintenance. If the bits of hair in the sink are driving you mad, this is your saving grace. If you’re new to male grooming and want to try out some different styles then this extensive grooming kit is a great place to start. The super sharp blades are suitable for cutting hair grades 1-10 and the unit comes with a separate trimmer for more precise trimming of the neckline and sideburns. The kit comes with a barber's comb, sectioning clips for longer hair, cleaning brush, oil and a handy storage case, and you’ll also get comb guides to help you perfect the ultimate barber finish. If you are the type of guy who changes your look frequently, you'll want a clipper kit that is as versatile as your changing styles, this set will be just that. One for the hipsters. To achieve the best looking beard you need to have this Remington Beard Kit in your bathroom. The kit includes a trimmer, scissors and a brush for the ultimate beard styling set-up. Many users say this trimmer has a great battery life, but also that the shape of the trimmer makes it tricky to shave at some angles. However, if you are an experienced beardsman, this trimmer can provide a quick and even result on all lengths of beard. For those of you who just want to trim and go, this DualCut Technology clipper is the fast and easy way to get salon-standard results. Aiming to trim your fuzz twice as fast as a standard razor, this speedy trimmer is our top pick for busy guys. Whether your hair is long or short, thick or thin, with 24 length control settings, you’ll be able to tailor the cut to your exact style too. Teamed with its handy hard case and 90 minute battery life, this trimmer is the perfect holiday companion and the best travel hair clipper for men on our list. You'll no doubt have heard of the famous contouring trend in the make-up world, well guess what guys? Now you can join in too. 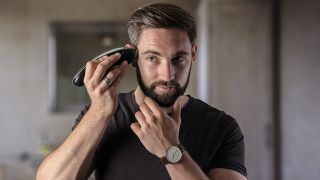 If you are a fan of the sharp, well-groomed look when it comes to facial hair, then the Babyliss iStubble Beard Trimmer is your new best friend. You can create the ideal amount of 'designer stubble' with this trimmers fine blades, then contour and define your face and jawline to finish the job off. This trimmer is not suitable for beards longer than 5mm, so the hirsute gentleman might want to opt for the Remington Beard Kit, but for shorter facial hair, it's a winner. Check out our guide to the best beard oils.